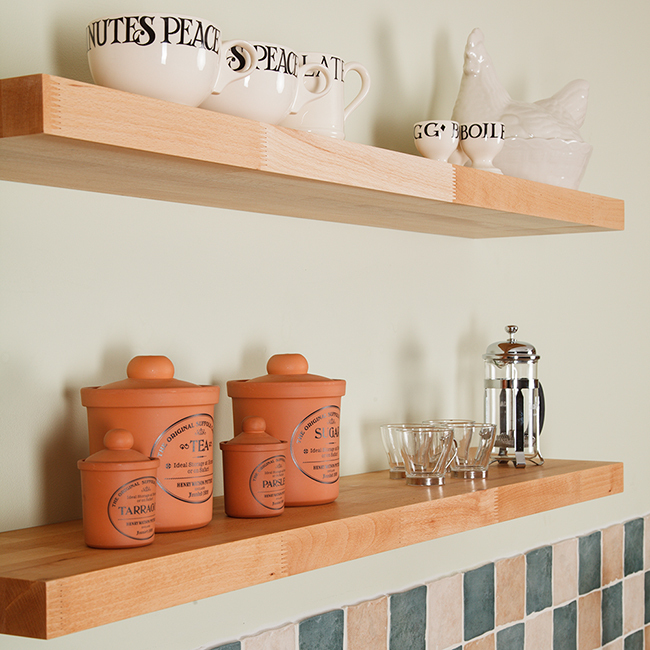 Solid wood floating shelves look impressive in any room, especially our beautiful wood kitchens! The charm of these floating wall shelves is undeniable, and - for your convenience - they are pre-drilled and supplied with the specialist fixings required to create the elegant floating effect. Our timber experts use their innovative equipment and extensive timber knowledge to produce floating wood shelves with the utmost precision. The surface is carefully sanded and oiled to enhance the beauty of the wood grain and achieve an attractive and consistent finish. This hard-wearing floating shelving is 40mm thick as standard, although our oak floating shelves are also available with a slimmer 30mm option. Each shelf is provided with a square edge profile for a substantial look that complements their contemporary style. All our floating shelves come with a number of 'invisible' fixings required to support their weight: two brackets for 300mm and 600mm shelves; three for the 900mm and 1200mm shelves; and four brackets for the 1500mm-long option. Each shelf is made from 40mm-wide wooden staves - just like our solid wood worktops. These staves are carefully glued together under high pressure, to create a strong bond that is guaranteed to last. Due to the weight of solid timber, we recommend mounting these shelves onto a sturdy brick or concrete block wall. If you have a stud partition wall, we suggest fixing the brackets directly to the studs. Solid wood shelves can occasionally contain very small knots, which are considered one feature of their natural and unique characteristics. Purchase high-quality floating wood shelves from Solid Wood Kitchen Cabinets®.